It's a snow day here in South Dakota! The kids are at my mother-in-law's since school and daycare are closed, and I'm bundled up in warm clothes watching the snow fall. I love snow except for the cold part. Can we have snow with 70 degree weather? This past weekend was a mini-project weekend. I hadn't been working on the house (or really anything) for almost two weeks because I was lucky enough to throw my back out. I still don't know how I did it, but I was pretty much bedridden for a week straight. I was finally ready to tackle some projects this past weekend. I am a bit bummed I'm not further on the house since I'm hosting a couple of get togethers in the next couple of weeks. Oh well. Those people will just need to deal with a half painted house. My goal is to be done painting before I put up Christmas decorations. This weekend I focused on finishing the trim. I know I've said it a hundred times, but I really really hate painting trim. I actually did a embarrassingly long happy dance when I finished up the last spindle on the banister. There may or may not been an attempt to moon walk. I also painted my first door. My goal is to do something to fancy up the doors upstairs and paint them white. Just like the trim, the long term plan is to eventually replace, but I'd like to do something until that day comes. You know...the day I win the lottery or am left a large inheritance from a long lost relative. I painted the front of the door with the same method I used on the trim (lightly sand, prime, paint), but I knew that wouldn't work on the back. We have a hanging rack over the door, and until the island is done, we need that storage desperately. 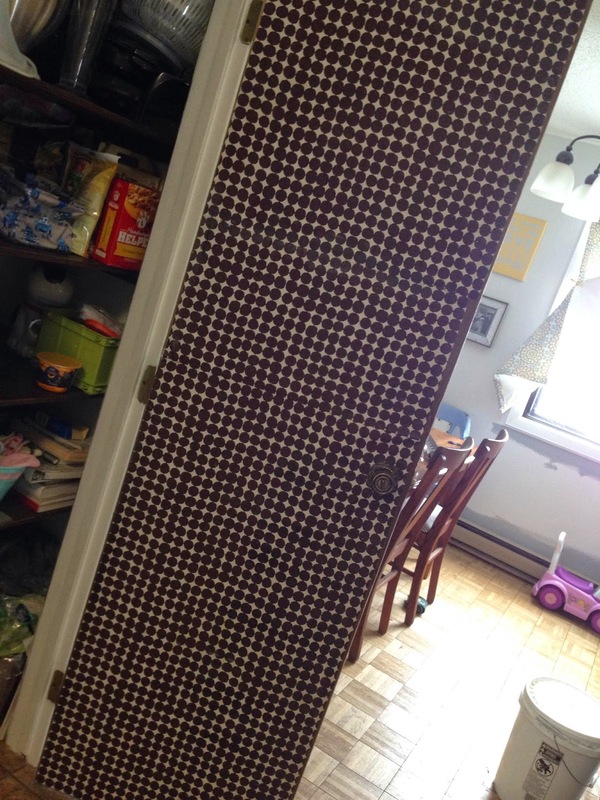 So, for now, I took some scrap fabric I had sitting around and Mod Podged it on the back of the door. It's a little surprise when you open the door. Not sure if I'm in love, but it's better than nothing. After I was done painting, I decided I needed another chalkboard. I'm a chalk-a-holic. I admit it. 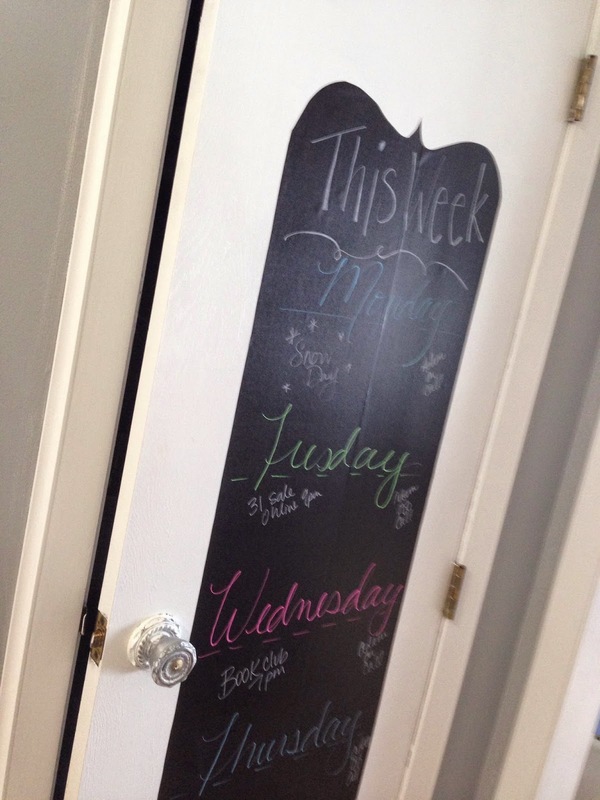 Put a chalkboard on anything I'll probably buy it. 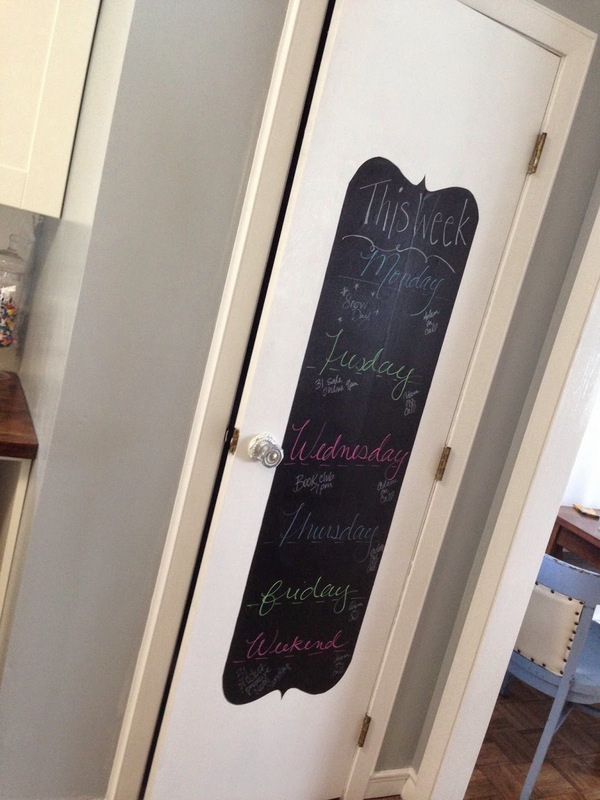 I thought about using chalkboard paint (and I even have some in the garage) but I was afraid that since the area is going to get some high use, and probably some little kids deciding to play with it, the paint would scratch. I bought some chalkboard vinyl, and used that instead. 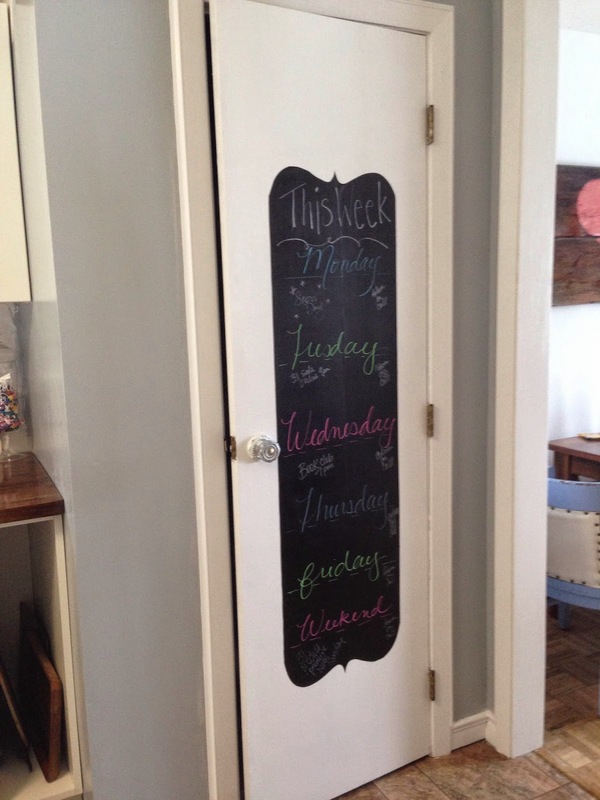 I've used chalkboard vinyl before and it's extremely resistant. Sad story about that stupid vinyl. I bought the vinyl thinking it would just cut it with my Silhouette and save myself a ton of trouble. Except I didn't look at the size of the vinyl and it was too wide to fit in my machine. I decided I'd cut the vinyl in half and then piece it back together on the door. Then I realized my machine wouldn't cut the vinyl since it was thinner than normal vinyl. So I ended up cutting it by hand and piecing it together. If I would have taken 2 seconds, I would have saved myself from having to piece it together, an extra hour of work and the the ugly seam. Argh. Live and learn, right? The last touch on the door will be a new door knob. The door knobs on the first floor are these awesome 1970's overly "fancy" brown knobs. They don't lock, they're ugly and they have to go. I use chalkboard pens. They are so nice when you want your text to look less like a 4 year old. Notice something wrong about the above picture? I misspelled Tuesday. Yes. My own daughter could probably spell Tuesday correctly. I'll be fixing that one before the husband comes home, and I never live it down. Just let your eyes focus on that ugly door knob instead. 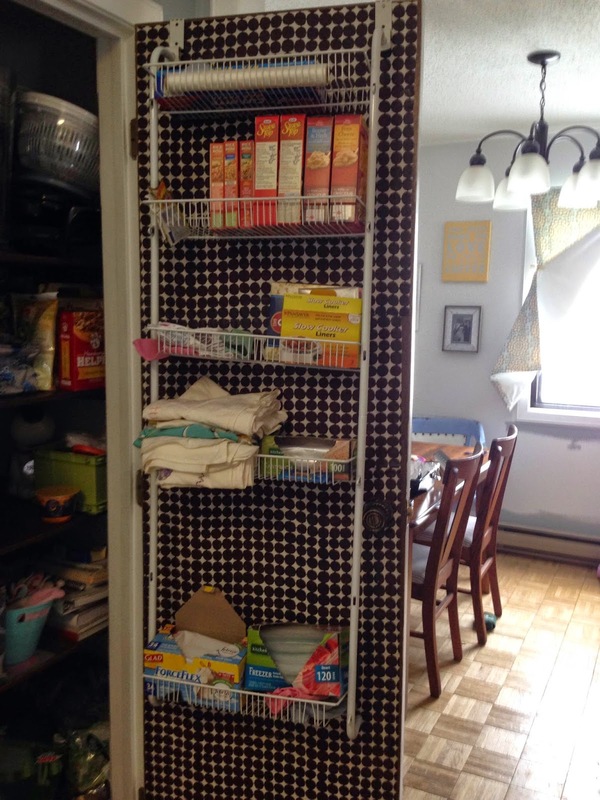 Don't you love my messy pantry, half painted wall in the back ground and clothes pinned curtains? This is the disaster I live in. All in the name of doing projects & blogging instead of housework.You're welcome.